How radioactive is a lightning storm? There are a lot of jaw-dropping facts about lightning. My favourite is that thunder is actually the sound of air suddenly getting heated to a temperature hotter than the surface of the Sun. As it expands from the heating, it generates shockwaves you hear as thunder. My second favourite lightning fact is that it shoots out bursts of X-rays just before a strike. Some researchers have worried about what the impact of those X-rays might be on the passengers inside a plane flying through a lightning storm - especially among staff and frequent air travellers. So a team of Dutch scientists mounted X-ray detectors on test flights through a storm that took place in April 2014. They recorded four lightning strikes. 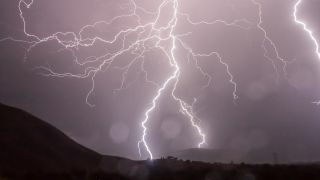 "These four lightning strikes represent all of the effects we were looking at, so they provided us with excellent data," said Pavlo Kochkin, the first author on the paper describing the results. According to their readings, the highest radiation dose from one of those X-ray bursts was about 0.000000000005gy - that's about eight million times smaller than the radiation dose you get on a long haul flight anyway. "We were extremely lucky to be able to work with our collaborators and Airbus," explained Alex van Deursen, another author on the paper. "This data is very interesting – we've made other lightning physicists quite jealous by getting it first!"